Let’s start with the basics and the main reason why penalties exist in the first place – link building. This is one of the most widely spread SEO techniques. It is used for improving your site’s ranking and traffic. Links, as one of the most important ranking factors, count as votes for the site they point to. The idea is to create links on other sites that will lead to your site in order to increase the authority of your site and get you more visitors. Higher authority and traffic can result in more leads, sales, customers, conversions or anything else really, depending on what your goal with the site is. That kind of links are called backlinks. Getting backlinks may sound easy at first but anyone who has some serious background in link building can tell you it’s not all sunshine and rainbows. There are different ways you can create backlinks for your site such as submitting your site to various business directories, through blog commenting, press releases, guest posting, broken link building and so on. Any method you choose, keep in mind one thing – not all backlinks you create are good ones. It’s silly to repeat this once again, but there are still SEO ‘experts’ that are saying otherwise. Usually, the better the link, the harder it is to get it. Take the majority of business directories for example. You can get a link in a few minutes on such a site, but just like you got it there, anyone else can get it too. That kind of sites are usually filled with backlinks, heavily spammed and a backlink from there doesn’t really have any value. On the other hand, if you want to get a link on Entrepreneur (just like we did for our client), you’ll need much, much, much more effort. Of course, link on Entrepreneur has its value even though it’s no-follow. Although creating ‘bad links’ now and then won’t necessarily get you penalized, they won’t do you any good either. Creating good links while keeping an eye on your existing backlinks (regularly checking and disavowing them – more on this later in the article) is the most convenient way to avoid getting penalized. If you somehow still get a manual action penalty, by your fault or someone else’s (negative SEO), we prepared this tried-out, proven-to-work, step-by-step, all-cards-on-the-table manual action penalty removal guide. You can do all of your work manually, but it’s very time-consuming. Wouldn’t recommend this to anyone since you’ll probably get lost in the piles of links. Since we are doing penalty recoveries on a daily basis, we are using the below-mentioned tools. If you are doing a one-time project, trial versions in some cases could be a good enough option. Note that if you want to use Link Detox, the trial won’t do any good since they have too many restrictions in the trial version. The first step in removing a manual action penalty is realizing you have one. Early signs for alarm are huge ranking and traffic drops. If you’ve added your site to Search Console, you can also check your manual actions there. Although both messages are for unnatural inbound links, you may notice they are slightly different. In the first message, Google is saying that they believe there’s an attempt to artificially boost site’s ranking. That will have a negative effect on their determination of site’s ranking. In the second message, they are saying that some bad links they’ve found may be outside of the webmaster’s control and it won’t affect site’s ranking. This could happen when they are suspecting there’s a negative SEO. The only difference in the process of recovery for negative SEO is something called a reconsideration letter (explained in details later), everything else is the same. No matter what kind of manual action for unnatural links you’ve got, the process of recovery is the same. In order to remove the penalty, you’ll have to gather backlinks through many different tools. After that, you’ll need to classify each link in order to make lists of links that you want to keep and those that you want to be removed. You’ll need to contact owners of the sites where you have backlinks you want to remove. In the end, you’ll need to create the reports and the disavow file, submit everything to Google and wait for their reply. This process can take from just a few days to several weeks, depending on how many links you have and how many attempts it will take you before Google removes the penalty. Oh, and one piece of advice – take screenshots of everything you do, you’ll have to use them later as a proof for Google. The first step is gathering as many backlinks as possible. You can never be sure you have all the links, but the above-mentioned tools are going to provide you with most of them. Lacking few backlinks shouldn’t affect the efficiency of the recovery process, although it’s a good practice to identify as many as possible. In this step, we are going to show you how to download backlinks from several different sources. The first source that we recommend is Google itself. You can find links indexed by Google in your Search Console. Under the menu item ‘Links to Your Site’, you can download 3 different files. Click on ‘More’ under ‘Who links the most section’ and click on each button to download tables and save them in CSV format. Moz has a set of tools that with an exhaustive list of features and it’s considered to be one of the most reliable ways of determining site’s domain authority. This time, use Moz’s ‘Open Site Explorer‘ (Moz OSE) for crawling backlinks. Insert your domain, target only root domain and in the end, request CSV. 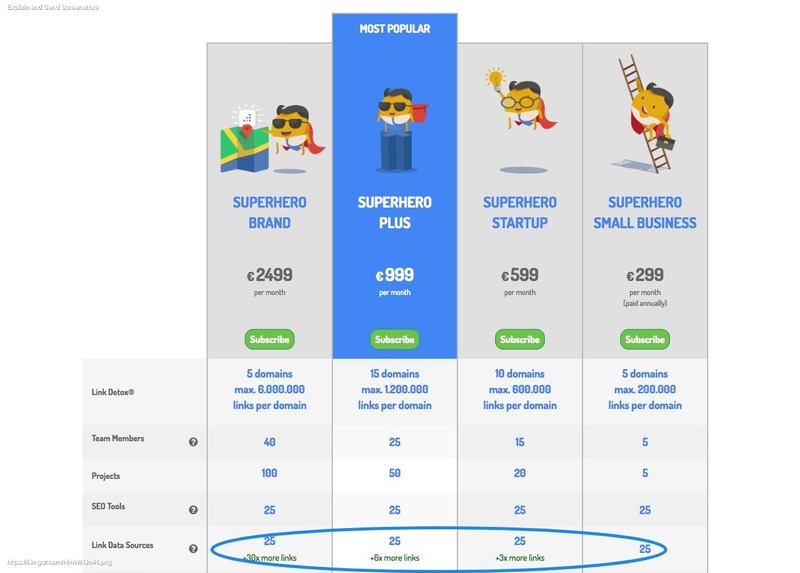 Same as with Moz, insert your domain and select ‘domain with all its subdomains’. Choose both HTTP and HTTPS versions of the domain, click on backlinks menu item and download both fresh and live links. Fresh links are the ones that had ‘live’ status sometime during the last 90 days (but may not be live anymore) while live links are the ones that are ‘live’ as we speak (as long as Ahrefs doesn’t re-crawls it and finds another status). WebCEO does something similar to Ahrefs, but with one key difference. It separates inbound links in two reports: one for live backlinks, and one for 100% dead backlinks – specifically, those that were lost recently. This removes the element of ambiguity and reduces the work you need to do. Another thing of note: WebCEO draws its link profile data from Alexa and Majestic (namely, their Alexa Traffic Rank, URL Flow and Domain Flow metrics). It’s like using two SEO suites at the same time, twice as fast! Nothing new here besides that fresh index is updated daily and it contains data from the last 90 days. The historic index contains all data that Majestic gathered. Just to be sure, download both. Later in the process, we are going to use one more tool to gather more backlinks but in order to do that, we have to organize what we have first. At this stage, we have a bunch of links in six different files. The next step is to gather all of them in one place. Since all the files were downloaded in the CSV format, we’re using Excel to organize the links. After you opened all files in Excel, copy all the URLs that link to your site in Notepad ++. For now, you only need URLs, we’ll focus on other details in steps that follow. All links are now in one place and there’s a big chance some of them are duplicated because Moz, Majestic, Ahrefs and Google, in most cases, are indexing the same links. You need to filter them to get a list of unique links. This is easily done in Notepad ++. Check if you have the TextFX plugin installed in Notepad ++ – if not, do that step first and follow the steps shown in the screenshot below. Now you finally have the list of unique backlinks to your site. For now, you only need backlinks that are live at the moment. You do remember downloading historic and fresh links, right? Since some of them are older than 90 days, they might not all be live, so we’ll have to check that first. To check if links are live use Screaming Frog tool. Screaming Frog is a versatile tool and can be used in numerous ways. Before you proceed, configure it for the task at hand. Make sure the Mode is set to the ‘List’ option. Under Configuration menu check Spider settings. Make sure that the Limit Crawl Depth on the Limits tab is checked and set to 0. Check the Advanced tab and set the Response Time value to 45 seconds and Max Redirects To Follow to 5. Save the changes and get back to the main window. In the Configuration menu select the Custom -> Search option and insert the domain you are checking (just the domain name, without the ‘http://www.’ part). Now you are all set to upload a list of your unique backlinks that you previously prepared. You can upload the whole .txt file or you can enter domains manually (copy-paste them from the file). Click Start and wait. This process could take a while, depending on how many backlinks you have and how many threads are you running. When this is done, the progress bar will reach 100% and you can check out results in ‘Custom’ tab. Make sure that the Filter is set to show only sites that contain the domain string you entered earlier. There you’ll see info for each backlink that is live. If you want to check all links, including those that are not live, go to the ‘Internal’ tab. Copy all the links from ‘Custom’ tab and paste them into a .txt file. You’ll need this file in the next step. Everything you did so far was just a preparation for the main act – Link Detox. LinkDetox is one of the Link Research Tools. These group of tools cover tasks like backlink analysis, link quality check, competitor analysis, backlink monitoring and link prospecting. For the purpose of the penalty removal process, we only need this one. In a few words, Link Detox is a powerful tool that excels as a great support with the backlink audit and penalty removal process – at finding backlinks to your site, analyzing and classifying them, creating a disavow file and other related tasks. Start a project by inserting your domain in the appropriate field by defining the details of your analysis. When it comes to penalty recovery, you need to analyze the whole domain. In step 3, Google is suggesting to add a no-follow tag to your links in order to remove the penalty. Does this mean that only do-follow links can be harmful? There are many contradicting opinions about this issue so it is hard to say for sure. One reasoning is that disavowing no-follow links is not necessary as they won’t do you any harm because they don’t influence rankings or penalties. The other opinion is that no-follow links can also be spammy, and since Google adds a lot of weight on user experience, any type of spammy links can harm your site, follow or no-follow. What is also really interesting is that most people consider that, by disavowing links, Google does nothing else but adds a no-follow tag to these links in their database. Do you remember the Entrepreneur’s no-follow link from the beginning of the article? Do you think it has no value? Well, we think it has a big value in Google’s eyes. Since the Google doesn’t want to solve this debate and give us a definite answer, we always recommend disavowing no-follow links too. This does require more work but it’s a safer route that will surely get you to desired location – a penalty-free zone if you will. On the other side, no-follow links can be obviously unnatural and by disavowing them, we reduce the potential risk without harming the site in the long run. Since there’s no such thing as too much caution when it comes to removing the penalty, we agree with Link Detox on this one. This is why you should go with the option: ‘Activating the NOFOLLOW evaluation’. You can also add the message you got from Google. Disavowed links – if you ever did backlink audit or penalty recovery before, you should upload links that you disavowed already. When Link Detox creates a report, you’ll see these links as disavowed and they will get automatically included in your disavow file. Ignore links – this option if for links that you want to ignore, but you don’t want to disavow them. You are now ready to run your report. Once you hit run, there’s no coming back. If you made a mistake, you’ll have to re-run the report and you’ll have to use a new credit for that. Support tickets won’t help in this case. Make sure you double-checked everything. This process could take up to a few hours. This feature is optional but if you classify your keywords, you’ll help Link Detox to calculate the risk of each link more correctly. You can go with two options: automatic or manual classification. In automatic classification, Link Detox will do all the work, and in the manual, you’ll have to classify them yourself. There’s a filter for anchor text that could help you out. Start with typing your brand name and other repeating keywords. Click ‘all’ to classify them all at the same time. TOX1 – Link Detox automatically rates links based on automated rules. One of those rules is TOX1. It means that site with this rule assigned is not indexed in Google. There can be several reasons for that – maybe it’s de-indexed due to a penalty or it has some problems with robots.txt or META robots tag. A domain that it’s not indexed in Google won’t help you so disavowing it is the best option. Filter links by category rules and check TOX1. After that click on the ‘bulk actions’. Bulk action means that you can apply the same action on more links. At this point, you are going to disavow links, rate them as bad and add the tag ‘Website not indexed’. You also need to find all unverified links because those sites are not live so you would only waste time on going through them. Some of them are maybe already in the ‘Website not indexed’ pile. In the ‘Tag’ filter, choose option ‘Empty’ and you’ll get only links that are not checked yet. Link Detox has an option of creating slices. This means you can sort out links by some specific criteria and save them as a slice. The tool has some pre-created slices with all the unverified links. Select slice ‘Unverified Links Only’. Again, use bulk option, but this time don’t disavow or rate links, just add tag ‘Unverified’. Again, select links with no tag, filter only the ones with ‘Anchor Text’ [LinkNotFound] and apply bulk action on them. Don’t rate or disavow those links, just add a tag ‘Link not found’. Those links are not live at the moment so you can’t know if they are good or bad. One thing we need to mention here is that the links might be unavailable (not live) at the moment you were running the initial report in Link Detox but are live after a few hours or days. The reasons for this might be numerous – the website was temporarily unavailable, server is currently down, slow response rate from URL etc. We recommend checking those links again in a few days with the Screaming Frog tool. You can also use WebCEO to filter out harmful backlinks, but in a noticeably different manner. Whereas Link Detox has preset rules for detecting dangerous and suspicious links, WebCEO gives you manual control over what it does and does not consider a toxic link. This provides a more flexible approach to managing your link profile, as well as your website’s defense against spammy links. Time for the most important part of the process – determining if a link is good or bad. Before clicking thumbs up or down for each link, be sure to get very familiar with Google Webmasters Guidelines. We always check each link, one by one. This is pretty important since you can’t know if a link (or domain) is good or bad without analyzing it. Classification of the links is going through ‘Link Detox Screener’. You can see different details about a link like URL, status, risk and anchor text. 2. Disavow – Disavowing link actually means that Google won’t take it into consideration when ranking your site but they will still be ‘live’ and you’ll be able to see them in Search Console. Once you disavow a link, there’s no coming back so use this feature with caution. There’s an option to disavow site on a domain or a page level. Usually, when the domain is bad, all of the pages on that domain are also bad. The situation is different when it comes to various blogging platforms or other Web 2.0 sites. For example, you obviously don’t want to disavow wordpress.com, but as a Web 2.0 platform, this domain has many spammy pages. This is where disavowing on page level comes handy. The same thing with Pinterest, Youtube, Google+ and similar websites. You get the pattern. 3. Rate – You can rate link as good or bad. If you rate link as good, don’t disavow them. 4. Skip sitewide links – If you want to avoid checking links on the same domain over and over again, there’s an option to skip sitewide links. Click on a setting button and confirm. Also, check the button below. When you’re finished with editing info about the link, click next. If you are not sure whether the link is good or bad, you can add a tag ‘?’ and come back to it later (just filter the ‘?’ in the Tag column), remove the existing tag and add a new one. If you are doing just backlink audit preventively and the site is actually not penalized, you don’t need to have strict rules for determining the quality of the link. In the case of a penalty, if you’re on the fence about the usefulness and quality of the link – it’s probably bad. Our rule is: „Each link is bad as long as we don’t prove otherwise“. So unless you want to repeat all of this once again, disavow suspicious links. Don’t worry about what you’re going to lose if you disavow the wrong link. You already have a penalty, how much worse can it get? You have all of the links and you decided which ones are bad for your site and want them gone. Before disavowing them for good, you need to try to remove them one by one. This is not an easy task.What you need to do now is to get in touch with the owners of the websites where you have bad links. The easiest way to do this is to get in touch with them and politely ask to remove them. Outreach, in our case, is done with the help of Pitchbox. Pitchbox (Incredibly powerful tool for finding influencers, bloggers, link prospecting and outreach, automatization) has an integration for Link Detox which makes this process less painful. First we need to create a new project in PB. Go back to Link Detox. In your report, in column Disavow, check links that you disavowed on page and domain level and click on the outreach button. This is the part where you create a campaign in PB. Name your campaign as you wish, select the project you previously created and insert your email account. Link Detox will send all relevant details such as domains, URLs, anchor texts and available contacts to Pitchbox. Open your campaign in Pitchbox, go to the ‘Personalize’ tab, select all opportunities and process them with Link Detox. Pitchbox has a pre written template for this occasion. You can see an example of a reply from a site that removed backlink just as you asked. If you receive a message like this, go back to your report in Link Detox and check if the link is really removed. After you are sure it is, remove the existing tag and add the tag ‘Removed with manual outreach’. This way you can easily filter links you’ve removed using manual outreach. You might ask yourself why is this important? This will be later used in your reconsideration letter to the Google Webmaster team as a strong proof that you’ve done all you could to remove all bad links. This is what distinguishes us from those that think it’s just enough to send Google a list of bad links. Well, it’s not enough and that’s why many people are struggling so long with the penalty. Creating a report for Google is optional but we found that attaching proofs of your work could increase chances of getting your penalty removed in case of unnatural link related manual actions. You can also export disavow file from Link Detox. Before you do so, it needs a little bit of editing. You’ll get a file with links disavowed on page and domain level, based on how you classified them in Link Detox. Also, some of the domains will be in format domain:pointvisible.com and others domain:www.pointvisible.com. You should create both versions for each domain unless you have an IP address. Then it’s enough to have the domain: ip-address.com. The last thing you need to prepare for Google to reconsider your request is the reconsideration letter. You should write about what happened (getting manual action penalty if this is the case), what you did to fix it (read Google’s guidelines) and what was the outcome (how many links you removed, how many are still live…). Also, don’t forget to include a link to report in Google Sheets that you’ve previously created. review for removing manual action (reconsideration letter + report). You can submit disavow file anytime you want, even if you don’t have a penalty. This way, you can keep your backlink profile clean and be sure you won’t get penalized. People usually believe that submitting disavow file too often will draw unwanted attention to their site, but actually, this is just a sign of well-maintained site. Go to the ‘Disavow links tool‘ and select your website. If you disavowed your links before, you’ll see info about that. Click on a ‘Choose file’ and upload your disavow file. Unlike disavow file, you can submit reconsideration only when there actually is a manual action visible under your Google Search Console. Go to your search console and under the Menu item ‘Manual actions’ click on a ‘Request a review’. Simply copy and paste the text you previously prepared in your reconsideration letter. For now, you did everything that you could and you need to wait for feedback from Google. When you do this, you’ll get confirmation emails from Google. You can get two types of messages from Google – a negative and a positive one. Simple! This means that your penalty isn’t removed. After reviewing your request, Google still believes there are some unnatural links to your site. If this happens, and it could, you need to go through the whole process once again. There’s a possibility that in the meantime, there are some new live links that need to be checked out. Just as Google is suggesting, this doesn’t guarantee your site’s ranking will increase. You can expect fluctuations in the first few weeks after removing your penalty. To keep your rankings steady (and increasing) focus on creating good links more than ever before, keep an eye on new links daily and disavow them regularly. As you may notice, removal of penalty has many steps and takes a long time to do it. Every project is different, and we can’t tell for sure how long it will take to go through the whole process. We can only assume. It’s a lot easier to predict the expenses. Once you pay for all the tools you are going to use, there should be no surprises. After you buy all the tools you need, your final cost would be 795 $ (or 698 $ without the Moz tool). *You need to insert your credit card details for 30 days trial but you can cancel the subscription anytime. Also, as an alternative to Link Detox, you can use WebCEO and their prices start from 99$. We need to mention that those prices are for lowest packages. If you’re an agency and need to do the penalty removal for multiple sites, the prices will rise. The time you’ll need to go through penalty removal process can depend on many things, for example, your internet speed or the speed of your computer. We made this evaluation based on the project with 500 unique live links that need to be checked. Working time is the time you need to spend working on something and waiting time is waiting for something, for example, waiting for the file to be uploaded or downloaded or a website to load (keep in mind that websites with bad links can take minutes to load before you can even check the link and classify it as bad or good). We’ve shown you step-by-step and every detail of our process of removing manual action penalty. Are you still willing to gamble and resort to buying 30 links for $2 a piece and other shady methods? So, rather than investing your time and money in removing your site from a disaster, focus on creating powerful editorial links. Of course, it takes a lot of work to do a proper research, create a high-quality content and do the outreach “asking for a link”. However, creating links on real and relevant sites will get you what you want – better ranking and more traffic to your website without living in a fear of getting penalized. If you have big outreach plans ahead of you, you should really be thinking about using an appropriate outreach tool. Luckily for you, we also made an in-depth comparison of the most popular outreach tools on the market so you have an easier time choosing the right one for your needs. Anamarija is a content strategist who is working her way up through recovering sites from penalties. She likes to share her experience through the guest post to help others. In the meantime, she's surprising her teammates with yummy desserts. Thanks for the feedback, @disqus_Qfy5VieYHQ:disqus. I’m sure there are different ways of doing a backlink audit, as well as different tools. The purpose of this guide was to describe how we do it at Point Visible. We can discuss the complexity of each step Anamarija identified, but I’m not sure how the ‘outcome can be better’, since we have 100% success rate with recovering unnatural links manual actions by following this guide. Quite a resourceful post but I appreciate it. Apart from above technique I preferably use Google console to extract back links and disavow feature to detox my un-natural links. And I used this technique for my my own site (http://ibgdigital.ae/).